Knockerball Tampa Bay is under new management. Looking for things to do in the Tampa Bay Area? Knockerball Tampa Bay offers you the most fun you will ever have! If you enjoy sports and playing games with your friends, then Knockerball is for you. 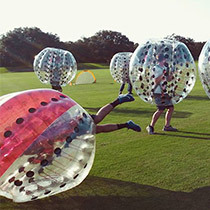 Knockerball combines the game of soccer with the contact of football and the safety of a giant inflatable ball. Play a variety of different games or just "KNOCK" into each other and see who is left standing. It is a great activity for ALL Parties & Events. Everyone will be entertained! Rent Knockerball Tampa Bay for your next party or event. We are mobile & travel all over the Tampa Bay Area to deliver the party to you. Why should you rent Knockerball Tampa Bay for your party? 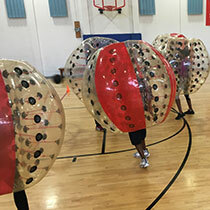 Knockerball is the highest-quality professional bubble soccer gear, it's industrial grade material makes it the safest & cleanest available on the market. Common Questions & FAQS about Knockerball Tampa Bay. Knockerball Tampa Bay prides itself on it's customer service. View Our Customer Reviews on Google, Yelp, & Facebook. Email and Text is the quickest way to get a response between the hours of 9am-6pm. We can bring Knockerball to you! Our street team can come to any location. Play inside or outside. Wanna see Knockerball in action? Check out our video gallery to see all the great bubble ball action! Knockerball is a single chamber inflatable sphere with inner handles and adjustable shoulder straps. Knockerballs range from Medium-1.2 Meters to Large-1.5 Meters and the size or fit is predicated on your height. Knockerballs can be used singularly to perfect your rolls, flips, and wheels. "KnockerBallers" describe the sensation as almost defying gravity, just imagine the sensation and mobility that a Knockerball allows you to experience. With two or more Knockerballs the experience is catapulted into rip roaring laughter, exhilarating knocks and rolls that will keep you coming back for more. Organizing a KnockerSoccer game is truly a blast, or just knock each other down. You will laugh so hard and have way too much fun. This sport is so new! We are proud to be instrumental in introducing one of the coolest products to you. 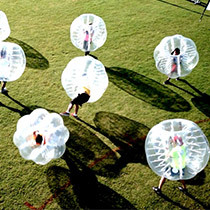 Till now, Knockerball or "bubble soccer" has been gaining traction in Europe, Australia, Japan, and elsewhere. Leagues are opening up all over the United States so isn't it time you "GET IN THE BALL" and see what you've been missing? Players must always be strapped in properly, play at their own risk, and follow player guidelines to reduce the risk of injury. Players under 5 feet must have adult supervision at all times. Only Knock another player while both are standing and never attempt vertical arial dives or jumping over top of another player as this may result in serious injury. Your KnockerBall - Bubble Soccer operator is a non-related party to KnockerBall USA LP and all operators maintain their own rental rates and scheduling.